There is a wealth of movie-related resources online. Beyond the obvious review sites, one can peruse elaborate fan theories, read up on how a biopic measures up against historical fact, or check if a given film passes the Bechdel Test. DoesTheDogDie.com catalogues movies in which animals are put in peril. Here we have a movie which is predicated upon the dog dying several times. Josh Gad provides the internal monologue of a dog’s spirit. In 1961, we meet this dog as the Golden Retriever Bailey. 8-year-old Ethan Montgomery (Gheisar) convinces his parents Jim (Kirby) and Elizabeth (Rylance) to let him keep the dog. They become best friends, and several years later, Bailey remains by the now-teenage Ethan’s (Apa) side as he falls in love with his classmate Hannah (Robertson). After Bailey dies, he gets reincarnated as Ellie, a German Shepherd K-9 who is paired with police officer Carlos Ruiz (Ortiz) in 80s Chicago. In her next life, Ellie becomes a Pembroke Welsh Corgi named Tino, who is taken in by an Atlanta college student named Maya (Howell-Baptiste) and accompanies her as she starts a family. Finally, Tino is reincarnated as a St. Bernard/Australian Shepherd mix named Buddy, who is neglected by his trailer trash owners Victor (Primo Allen) and Wendi (Nicole LaPlaca). Buddy is eventually dumped in an abandoned lot, and seeks a place where he belongs and after many lifetimes, comes to understand what his purpose on earth is. 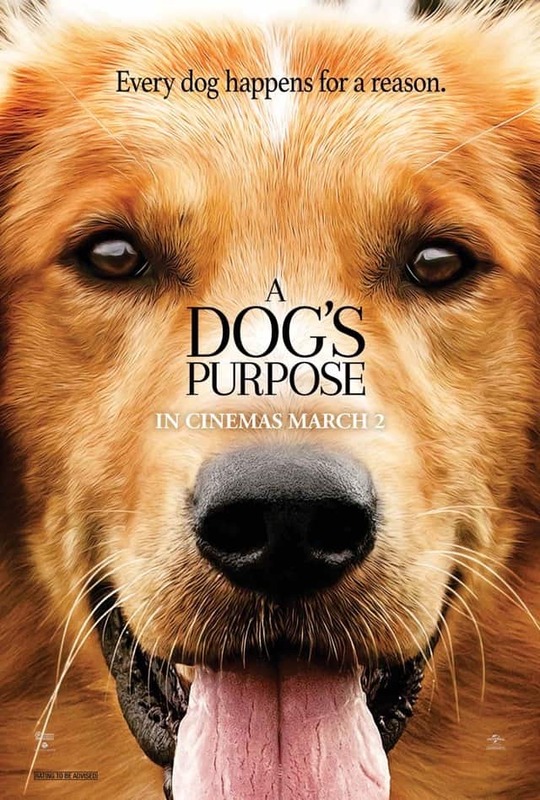 A Dog’s Purpose is adapted from the novel of the same name by W. Bruce Cameron, who is also one of the five credited screenwriters. Director Lasse Hallström, who also helmed the canine-centric Hachi: A Dog’s Tale, has put together an unabashed tearjerker. A Dog’s Purpose is geared towards anyone with even the slightest affection for dogs and advocates adoption and rescue. The problem is that people who love dogs generally don’t want to see dogs in pain or die onscreen, and there’s a great deal of canine misfortune, packed in with cutesy shenanigans. The emotional manipulation is plentiful and blatant, and because of the film’s episodic nature, the relationships between the human characters are largely simplistic. Then there’s the elephant in the room, the infamous leaked video taken on the set of the film that showed a German Shepherd named Hercules being forced into rushing water. This drew sharp outcry, and while an investigation conducted by an independent animal cruelty expert concluded that proper safety measures were taken and that the video had been manipulatively edited, the damage was done. The film’s Los Angeles premiere was scrapped and A Dog’s Purpose will forever be tied to the abuse allegations. It’s possible that animals are often coerced in the making of movies and TV shows, if not mistreated, and this has further fuelled the debate of whether animals should be made to perform for the sake of human entertainment. It dates back to the days of circuses, and we’ll go out on a limb and say that animal actors in Hollywood are generally treated far better than circus animals. A Dog’s Purpose is ambitious in that the story spans several decades, and it features a convincing if sanitized re-creation of nostalgic Americana in its first segment. Bradley Cooper was originally cast as the voice of the dog, and was replaced by Gad. Gad has the wide-eyed earnestness down pat, but the voiceover is a big part of why the film is as heavy-handed as it is. Apa, currently playing Archie on Riverdale, makes for a decent teen heartthrob, while Robertson is appealing as she usually is. Quaid, the film’s most recognisable star, doesn’t get all that much to do. Both Ortiz’s Carlos and Howell-Baptiste’s Maya are likeable in their own ways, but suffer from the thin characterisation necessitated by the film’s vignette format. A Dog’s Purpose is filled with especially adorable canines (our screening seemed particularly taken with that Corgi), but its sentimentality is relentless and comes off as patronising. The plot of A Dog’s Purpose needs multiple dead dogs to make its altogether simple point. There are charming moments and large swathes of moviegoers will get misty-eyed, but A Dog’s Purpose often forgoes meaningful storytelling in favour of emotionally-manipulative shorthand. Summary: There’s little profundity to be found in this tearjerker, though some will find its syrupy aw-shucks wholesomeness appealing. And, naturally, the dogs are really cute.